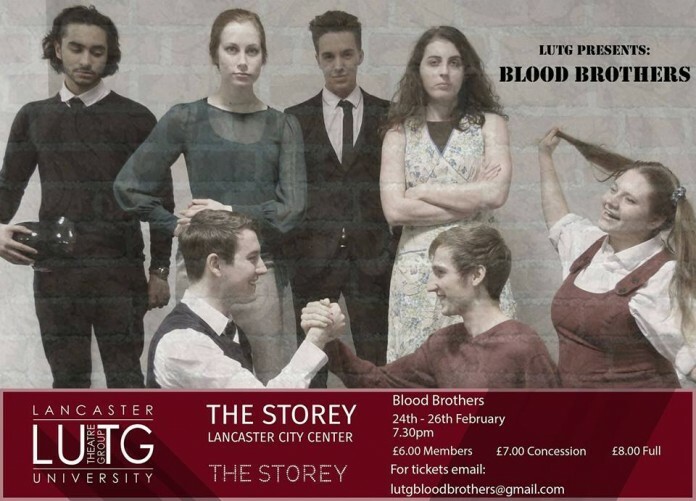 Taking on a well-known script isn’t an easy task – especially when the script in question is Blood Brothers and the theatre group is student-run, which would, stereotypically speaking, tend to imply a tighter budget, smaller crew, and a sense of a make-do-and-mend attitude. More often than not, this is actually an advantage, leading to creative inspiration as cast and crew work around their limitations, and the team behind LUTG’s production of Willy Russell’s hugely successful play (bear in mind this is the non-musical version) show examples of this throughout. At its heart a comedy, but with tragic socio-political undertones that lurk in much of Russell’s work, Blood Brothers tells the story of twin brothers Eddie and Mickey, separated at birth, and kept apart by their respective biological and guardian-mothers. We follow the Johnston twins from best friends to otherwise, as their lives helplessly intertwine and become intrinsically enmeshed to head towards a dangerous collision of opposing ideologies. Director Melissa Curd’s adaptation is more geared towards an affectionate tribute rather than a bold directorial statement, staging the first act with the two settings of the different families side by side, allowing the themes of class divide to flourish. Opening with Eddie and Mickey entering the stage on their respective sides, the Narrator comes out between them and asks the famous rhetorical “so did y’hear the story of the Johnston twins?” accompanied by eerie yellow light and live piano playing courtesy of stage manager Beth Manicom. It’s an impressive opening gambit, proving that Curd’s seemingly straight adaptation has its own nuances for LUTGs iteration. The piano motif returns throughout, signifying the Narrator’s entrance and the return of the ‘devil’ referred to in his verse dialogue, which could be seen to represent social injustice, repressive familial ties or economic repression. Speaking of the Narrator, James Grant plays this role pretty much spot on, a Mad Men-esque presence popping in to provide poetry and sometimes even positioning himself between Mickey and Eddie’s arguments. It’s a good direction and acting combination, as Grant looks at the audience like some kind of master puppeteer, sipping whisky smarmily. Sometimes it can be a little too sarcastic, but this is intentional; we are not supposed to like him, much as we are not supposed to like the doomed fate of the Johnston twins. Maz Kamyab’s Shakespearian clown characters are the antithesis to this, providing much needed light relief to an often very dark play, juggling various roles effectively. The play really kicks into gear when the twins arrive on the scene. Chad Bunney as Eddie and Josh Hawley as Mickey are, truly, fantastic, finely juggling comedy and tragedy in equal parts. There’s a bit of a dip in engagement in the segment post-narration opening and Hawley and Bunney’s appearance; the very expository-heavy dialogue between Mrs Johnston and Mrs Lyons appears a little rushed. Yet when we are introduced to the “not seven, nearly eight” twins, Curd gives real room to let the characters breathe. Hawley’s Liverpudlian accent is spot on, and so is his acting, showing versatility between childlike wonder and rebellion to furious anger and thirst for vengeance, screaming at Bunney in the final act. County College BNOC Bunney is equally impressive, playing Eddie’s more reserved nature and inbuilt naivety effectively. In many ways, Eddie’s character has more scope for laughter in his unexpected humour, particularly in one section where he tells Mickey a rather extravagant and theatrical way to seduce a girl. The audience loves it, laughing and clapping Bunney, who struggles to keep a smile off his face. The girl in question here is Linda, played by Katie Marrin, who, in many respects, mirrors her mother in law Mrs Johnston, played by Nikki Hosker. Marrin’s arc goes from a mischievous girl to love interest to downbeat housewife, which she pulls off quietly and convincingly. In one great bit of directing, Curd puts a mirror in front of her as she gets ready to meet Eddie illicitly, showing how her life has so rapidly changed before her (and our) eyes. Hosker’s role is probably the most difficult to pull off, as to illicit that much sympathy from the crowd requires a graft to the cause. Her Mrs Johnston is one who remains optimistic despite her circumstances, offering a futile glimmer of hope. Lizzie Bradley plays Mrs Lyons, who uses her authority as Johnston’s employer to persuade her to give up one of her twin babies, claiming him as her own child. Bradley plays the role coolly, with an austere, upper-class tone that seeps further and further into mental illness as the play develops. Whilst this can occasionally slip into caricature, depicting mental illness physically – for theatre is, by and large, a physical medium – is such a difficult tightrope for an actor to walk; overall this is pulled off very effectively, and it is never problematic. Alongside lines from Eddie that highlight the importance of this often overlooked health issue, it becomes a particularly prescient theme, especially with the upcoming University Mental Health Day on the 3rd March. Unfortunately, the final scene lacks the bite of the second act, which sees Mickey and Eddie’s friendship breakdown catastrophically. The staging, which – spoiler alert – sees Mickey race into Eddie’s office, threaten to kill him, before both mothers enter and reveal all, leading Mrs Lyons to accidentally shoot the twins – is as fast paced as it sounds, ending the play rather too quickly and dissipating some much-needed dramatic tension. There are other staging issues that could have been resolved, such as the placement of much of the early action on the floor, which some of the audience fail to see due to the arrangement of the theatre in the Storey. However, the strength of the acting, and the coherent team – featuring Abigail Beavan, Emily Millington, Beth Manicom, Sophia Oldeide, Frances Barker, Alex Coy and Victoria Hatch working together as a solid unit – makes LUTG’s Blood Brothers a pretty special production. Leaving the theatre having laughed and cried in equal measure, the audience are satisfied and the cast are celebratory. It’s their last show, and it’s one that’ll be missed.